Villa Monte in Camerata or Villa Talpa, passed on to many other owners. The Albizi Family bought the Villa in 1648. The Albizi Family made several structural modifications during the 1700's. Today the Villa is similar to what it looked like during that time. The central courtyard was covered and decorated with stuccos and became the Dancing Hall. In order to store The Albizi Family collection of paintings, a wing of two floors was erected. The Villa was later bought by The Pucci Family in 1800. The Pucci's improved the garden by recreating it as a popular English garden. At the start of the 1900's The Tharp Family became the next new owners. In 1934 The Villa Monte in Camerata or Villa Talpa residence was bought by The Morgans, a United States Family who sold out in 1955 to The Azienda Autonoma Turismo di Firenze. 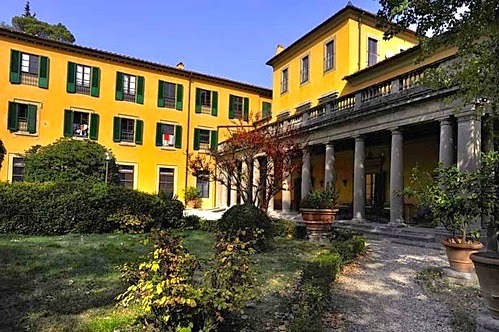 The Azienda Autonoma Turismo di Firenze converted The Villa to use as a Youth Hostel. Today Villa Camerata is managed by The Associazione Italiana Albergi Per La Gioventù. لمحة تاريخية عن "كمرتا VILLA"
الفيلا، portave في الأصل اسم "فيلا مونتي" في كمرتا أو "تايبا فيلا". في عام 1648 تم شراء من قبل Albizi الأسرة. في 1700 لتعديل واجهة Albizi وبهو الغرفة، تزيين مع strucchi. في عام 1800 تم شراء الفيلا من قبل بوتشي منمق الخارج، وتحول الحديقة وحديقة على الطراز الإنجليزية. النقابة السياحة، والذي تم تجديده وذلك في مصير نزل للشباب، ويعهد إلى بيوت الشباب الإيطالي. الشباب على وعي متزايد وتطلبا.